Its face features innocent-looking blue eyes, wide-set ears, a well-defined chin, and wedge-shaped head. The body is sturdy, sporting a medium- to large-size frame, substantial muscles and bones and a characteristic fatty pad tucked under the abdomen. Ragdoll kittens are also born white, but some slowly develop light-colored coats with Siamese-like darker points. The Ragdoll offers a beautiful look of elegance with the benefits of a non-matting, low-shedding coat that feels soft and silky. Just run a steel comb one or two times a week to remove loose hairs and keep the coat looking its best. Females weigh between 12 and 15 pounds and males average between 15 and 20 pounds. If you’re looking for an easygoing cat who enjoys being held or sprawled in your lap, the Ragdoll is ideal. These cats enjoy playtime, but are not overly demanding or boisterous. They enjoy trotting along side members of the house and retrieving tossed paper wads. They enjoy activity more at ground level than some breeds who prefer surveying from high perches. Be aware that your Ragdoll may join you in the shower or bathtub as they are highly intrigued by the sound of water. Their super sweet, trusting nature can put them in danger. This breed should never be allowed outdoors without supervision. The Ragdoll is on a fast track in popularity. It ranks second only to the Bengal in The International Cat Association and sixth in the Cat Fanciers Association. This breed is slow to grow, taking up to four years to reach full physical maturity. A Persian cat breeder named Ann Baker is touted for creating this breed in the 1960s. She bred a neighbor’s longhaired white cat named Josephine with male Siamese and Persians she owned at her Riverside, Calif. home. The result produced sweet tempered kittens with non-matting coats. This breed garnered its named from the popular myth that they go completely limp when picked up – just like a rag doll. 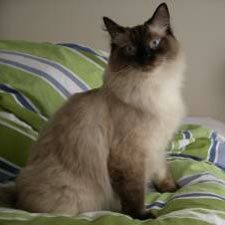 Ragdolls compete for championship status in all major cat registries except for the Cat Fanciers Association. Since 1993, the CFA has granted Ragdolls to compete only in the miscellaneous class.